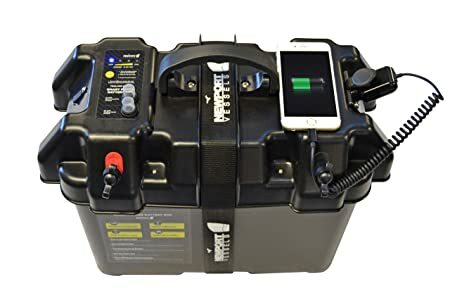 The Newport Vessels Smart battery box power station is a perfect solution for protecting your battery while providing quick and clean access to hook up your motor’s power cables to the Smart box’s terminals. The Newport Vessels Smart battery box power station is also a fully functioning power and charging station. With a USB and a 12V DC power outlet, you can easily charge your most important devices while out on the water. The outer shell’s power interface provides a visual LED battery meter displaying your motor’s battery state. Also provided are a test button, and two waterproof breakers for both the 60 amp trolling motor terminals and the 10 amp boat accessory charging ports. The Smart battery box power station also has rubberized feet inserts built into the bottom, so that your battery box will stay put. The Newport Vessels Smart battery box power station is the ultimate accessory for all trolling motors, inflatable boats, and small boats. The NV Series 36lb thrust electric trolling motor by Newport Vessels. This versatile and all around use trolling motor is constructed with the highest quality materials and design concepts. This trolling motor is built to last. With an adjustable 30-inch shaft length, the Newport Vessels 36lb thrust trolling motor is built to fit all Newport Vessels inflatable boats as well as all other inflatable boats, kayaks, dinghies, tenders, fishing boats, aluminum fishing boats, and inflatables with a transom. The 8 speed control system (5 forward speeds and 3 reverse speeds) makes for a smooth and easily controlled ride. 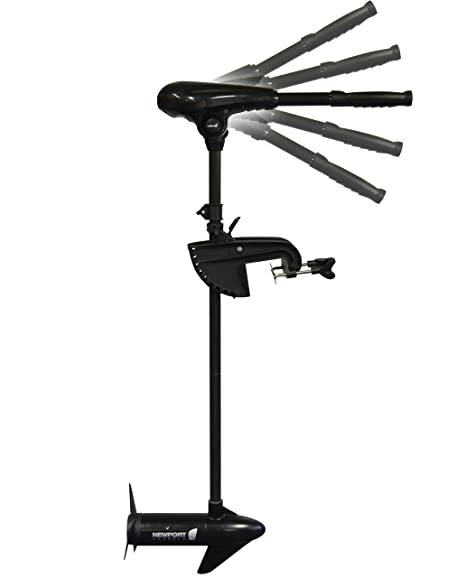 The 36lb thrust NV Series trolling motor comes with a 2 blade propeller (8.9 inch diameter) for optimal performance. This transom mount motor is built to be powered by a 12-volt Deep Cycle battery or Marine battery (not included). High quality & heavy duty salt & freshwater inflatable sport dinghy tender boat. 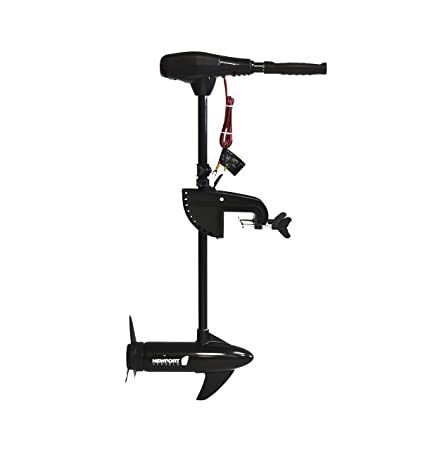 Boat is tested and designed for both 15″ short shaft outboards and 20″ long shaft. 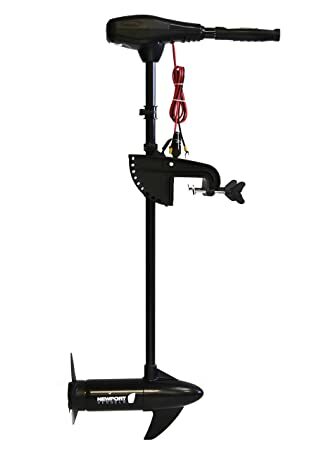 For optimal performance we recommend a 15″ short shaft outboard. Can handle both 2 or 4 stroke motors. Comes with all original paperwork needed for easy and hassle free registration. Newport Vessels is USCG rated and registered. Unique and original Hull ID/HIN numbers with each boat Comes with Newport Vessels 2 year warranty. Newport Vessels Polyester inflatable dinghy boat cover with heavy duty 600D Polyester with UV resistant based material provides protection against the suns damaging UV rays. The double stitched and interlocked seams offer excellent durability and will not stretch. The bottom elastic hem allows for proper ventilation to avoid mold growth and build-up. 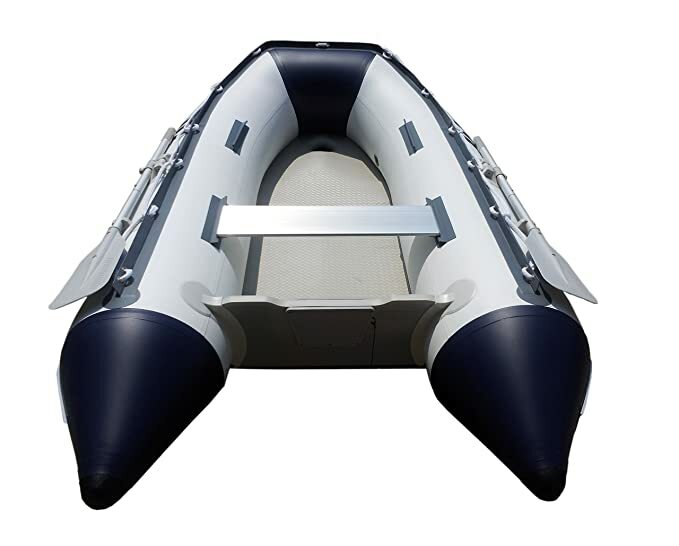 The buckle and strap system allows the inflatable boat cover to fit Newport Vessel’s own various sized boats, as well as most brands and models such as Zodiac, Avon, Achilles, West Marine, Saturn, Mercury, Baltic, etc. Simply tighten the buckles to create the perfect fit. The full rear cut allows for the cover to fit over both the motor and boat. The Newport Vessels inflatable boat cover comes complete with a mesh carrying bag for easy storage and transportation when not in use. A must-have item to protect and prolong the lifespan of your boat if you plan on keeping inflated for an extended period of time. 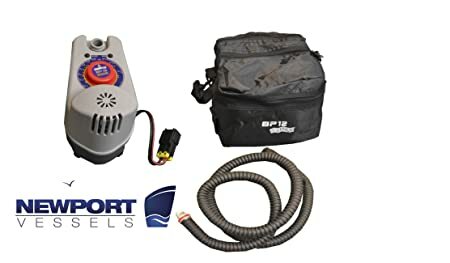 The Newport Vessels high pressure electric pump is the ideal solution for quickly inflating or deflating your inflatable boat or standup paddle board. Powered by a 12 Volt DC battery the electric pump has a max PSI of 14.5 air pressure, more than enough to inflate or deflate any inflatable board or SUP. The 6ft air hose fits all Halkey Roberts valve fittings and the 9ft long battery cable will give you plenty of space to use the electric pump is any area. This electric pump is easy to use, the analog dial pressure gauge stops automatically when the selected PSI is reached. The electric pump, hose, battery cable all store perfectly in its own carrying bag. The NV 86lb is Newport Vessels most powerful motor; at 25 lbs, this motor maximizes power to weight ratio. 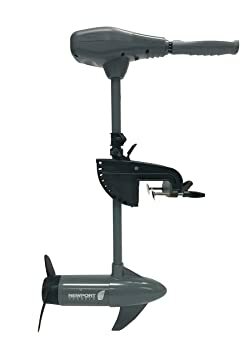 Featuring a durable 36-inch fiberglass composite shaft and tough nylon transom mount, this motor can fit almost all small to medium, transom mount watercraft. An ultra bright 5-point LED battery indicator ensures you always have an easy to see, accurate charge reading. Superb build quality, and corrosion resistant componentry ensure this motor is saltwater and freshwater compatible; while outstanding power, ease of use, and craftsmanship make this motor an easy choice for anglers and boaters everywhere. Note: This motor requires two (2) 12V deep cycle or marine batteries for operation. Batteries must be purchased separately. 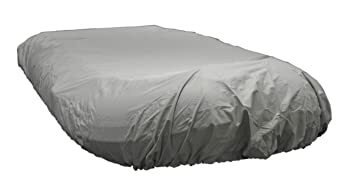 Newport Vessels Polyester 10ft to 11ft inflatable dinghy boat cover with heavy duty 600D Polyester with UV resistant based material provides protection against the suns damaging UV rays. The double stitched and interlocked seams offer excellent durability and will not stretch. The bottom elastic hem allows for proper ventilation to avoid mold growth and buildup. 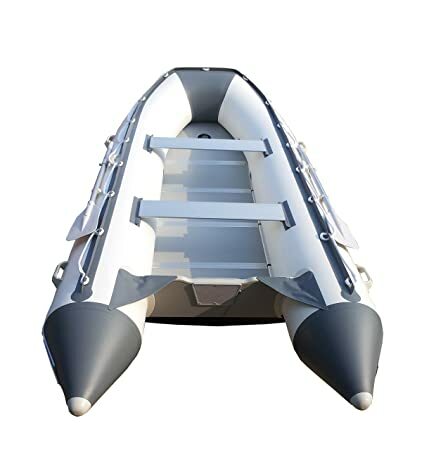 The buckle and strap system allows the inflatable boat cover to fit Newport Vessel’s own 10ft 6in Newport as well as most brands and models such as Zodiac, Avon, Achilles, West Marine, Saturn, Mercury, Baltic, etc. Simply tighten the buckles to create the perfect fit. The full rear cut allows for the cover to fit over both the motor and boat. The Newport Vessels 10ft-11ft inflatable boat cover comes complete with a mesh carrying bag for easy storage and transportation when not in use. A must-have item to protect and prolong the lifespan of your boat if you plan on keeping inflated for an extended period of time. The 62lb NV Series offers a tried and true design, ready to tackle any body of water. The 3-blade propeller allows for near silent operation, so you never scare away fish! With 62lbs of thrust at your fingertips, and a bright 5-point LED battery meter, this motor keeps you on the water all day long. A durable nylon transom mount, and a 36-inch adjustable shaft, means this motor can fit nearly any small to medium personal watercraft. High quality, corrosion resistant hardware ensures this motor is ready for any environment, with saltwater and freshwater compatibility. Ease-of-operation, quality, and efficiency make this motor the #1 choice for anglers and fisherman everywhere. 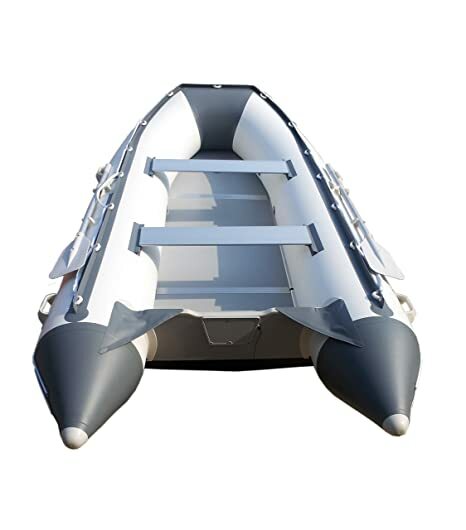 High performance & heavy duty salt & freshwater inflatable sport dinghy tender boat. 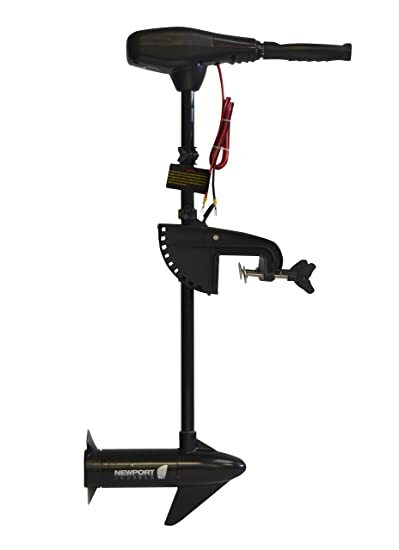 Boat is tested and designed for both 15″ short shaft outboards and 20″ long shaft. For optimal performance we recommend a 15″ short shaft outboard. Can handle both 2 or 4 stroke motors. Comes with all original paperwork needed for easy and hassle free registration. Newport Vessels is USCG rated and registered. Unique and original Hull ID/HIN numbers with each boat Comes with Newport Vessels 2 year warranty. The small and extremely portable 9ft inflatable sport boat can be inflated and deflated in less than 5 minutes. The Seascape is perfect to use as a versatile tender boat, fishing boat, or small run about boat. The Seascape has extremely large tubes (18inches) which makes it very stable and maneuverable at high speeds. If you’re looking for speed and performance, the ideal motor paring is the 9.9 Honda outboard, Tohatsu outboard, or Evinrude outboard or any comparable motor. You can reach speeds of 25+ mph with this set up. The extremely high-pressure inflatable keel allows the inflatable boat to reach maximum performance while banking, turning, and accelerating. The materials used to construct the Newport Vessels Seascape Model are triple layered 1,100 denier PVC. What’s this mean? It means we use the exact same materials used in professional White Water rafts. In fact we use an extra layer of polyester in our boats to give the material more flexibility for when folding up and storing away. Since our boats are made with the same materials, same construction methods, and techniques, our boats are just as indestructible as white water rafts. Our boats are made to be dragged up on shore, run into docks, and to keep up with the wear and tear of boating. 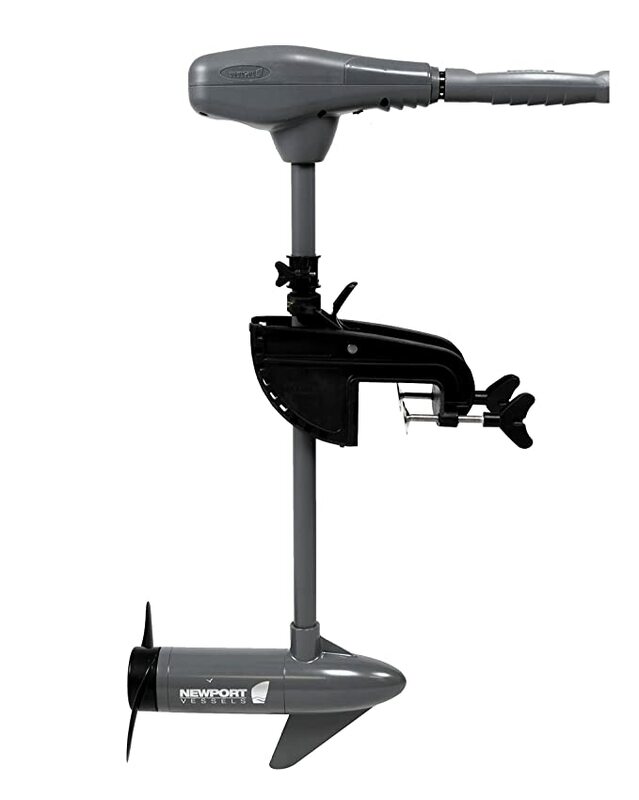 The Kayak Series 55lb thrust electric trolling motor by Newport Vessels is designed specifically for kayak anglers. We have taken our years of trolling motor design and manufacturing experience, and focused it directly on creating a motor that fits the unique needs of kayak anglers. This is the first kayak specific motor to offer top-level performance in a reliable and high-quality package, at an affordable price. Each of our kayak trolling motors comes with our one year warranty and is backed by our California based, industry renowned customer service team! The Kayak Series trolling motor is Newport Vessels first kayak specific motor. Building on the tried and true design of our NV Series trolling motors, the Kayak Series features a height adjustable 24-Inch shaft for proper depth placement. We have added extended battery cabling to provide for flexible battery placement, ensuring compatibility with transom mount kayaks and canoes. Five forward speeds and three reverse speeds allow for a smooth and efficient ride, a 5 LED battery indicator ensures you know how much run time is left on your current charge. The Newport Vessels 55lb thrust kayak Series motor comes equipped with a 3-blade propeller to reduce drag, balancing efficiency and thrust for optimal performance. The Kayak Series trolling motor is designed to be powered by one 12-volt deep cycle or marine battery (not included). Fishing from a kayak allows you to get in close to the action without scaring away bass and other shallow water fish. Utilizing a trolling motor allows you to quickly access your favorite cove, so you can spend your day casting, not fighting the current or paddling through chop and the wakes of bigger boats. The ultra quiet operation of the Newport Vessels Kayak Series 55lb thrust trolling motor ensures a stealthy approach, placing you right on top of fish bigger boats can only dream of. The Kayak Series 36lb thrust electric trolling motor by Newport Vessels is designed specifically for kayak anglers. We have taken our years of trolling motor design and manufacturing experience, and focused it directly on creating a motor that fits the unique needs of kayak anglers. This is the first kayak specific motor to offer top-level performance in a reliable and high-quality package, at an affordable price. Each of our kayak trolling motors comes with our one year warranty and is backed by our California based, industry renowned customer service team! The Kayak Series trolling motor is Newport Vessels first kayak specific motor. Building on the tried and true design of our NV Series trolling motors, the Kayak Series features a height adjustable 24-Inch shaft for proper depth placement. We have provided extended battery cabling to provide for flexible battery placement, ensuring compatibility with all transom mount kayaks and canoes. Five forward speeds and three reverse speeds allow for a smooth and efficient ride, a 5 LED battery indicator ensures you know how much run time is left on your current charge. The Newport Vessels 36lb thrust kayak Series motor comes equipped with a 2-blade propeller to reduce drag, balancing efficiency and thrust for optimal performance. The Kayak Series trolling motor is designed to be powered by one 12-volt deep cycle or marine battery (not included). Fishing from a kayak allows you to get in close to the action without scaring away bass and other shallow water fish. Utilizing a trolling motor allows you to quickly access your favorite cove, so you can spend your day casting, not fighting the current or paddling through chop and the wakes of bigger boats. The ultra quiet operation of the Newport Vessels Kayak Series 36lb thrust trolling motor ensures a stealthy approach, placing you right on top of fish bigger boats can only dream of. Offering a perfect balance of power and efficiency, the NV 55lb is Newport Vessels most versatile trolling motor for small and medium sized watercraft. The 3 blade propeller offers near silent operation, so you never scare away fish! With 55lbs of efficient thrust at your fingertips, and a bright 5 point LED battery meter, this motor keeps you on the water all day long. 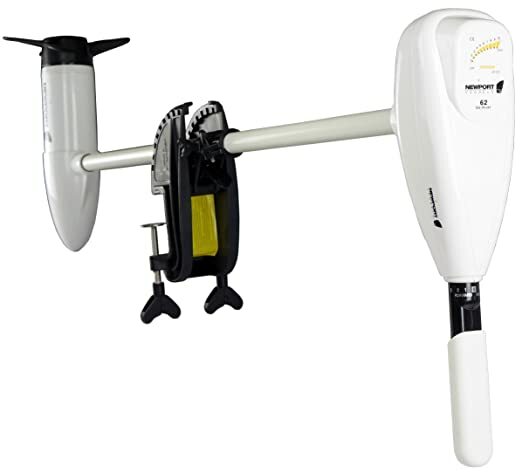 A durable nylon transom mount, and a 30-inch adjustable shaft, means this motor can fit almost all small to medium sized watercraft. High quality corrosion resistant hardware ensures this motor is ready to tackle any environment, with full saltwater and freshwater compatibility. Ease-of-operation, quality, and craftsmanship make this motor the #1 choice in its class. 62lb thrust electric trolling motor by Newport Vessels. Built with stainless steel and zinc hardware, composite fiberglass shaft and durable aluminum head; This motor is built to last. With a 40 inch shaft length, the Newport Vessels trolling motor is adaptable to fit almost all small boats (inflatable boats included). 8 speeds (5 forward speeds and 3 reverse speeds) make for a very smooth and easily controlled ride. Runs smooth with any 12-volt Deep Cycle battery or Marine battery (not included).